I am travelling to Krasnodar from London in the middle of November, changing at Moscow Sheremetyevo. I have to get from terminal 1 to terminal 2 to catch the second flight. Can anybody give some indication on how to do this? Are they within walking distance; I have 2 hours 30mins between flights? Will the Moscow weather be bad at that time of the year? I land at 5:30 am and leave for Krasnodar at 8:00. Is it sake to walk at that time in the morning? Is there a bus or does it have to be a taxi? How much should the taxi cost? As a foreigner I expect to get ripped off a little, maybe double what a Muscovite would pay but not 10 or 20 times as much. I have about 7,500 roubles, which I expect to be enough for the first few days but not the whole trip. For the remaining spending money I would prefer to bring English pounds. Is it possible to easily change English pound in a city the size of Krasnodar or is it essential to take either US dollars or Euros? On the return journey I have just over 4 hour between flights at Sheremetyevo. Is there anywhere worth visiting in the immediate area? I am travelling to Krasnodar from London in the middle of November, changing at Moscow Sheremetyevo. I have to get from terminal 2 to terminal 1 to catch the second flight. London is in Sh-2! Krasnodar Sh-1. The terminals Shermyetovo-1 and Shermyetovo-2 are on opposite side of runways! It is take about 5 km by the road. № 817 "metro — Sh-2 — Sh-1 — metro Planernaya(Планерная)"
№ 851 "metro — Sh-1 — Sh-2 — metro Rechnoy vokzal (Речной вокзал)"
small-bus (маршрутное такси) line № 48 are direct from Sh-2 to metro Rechnoy vokzal. маршрутноt такси № 49 Sh-1 to metro Planernaya. and маршрутноt такси Sh-2? to metro Voykovskaya(Войковская). Usual tax is about 13-15 rubles/km so 100 roubles would be enough. Buit it is international airport and I think the price should be triple. 300-500 roubles. I think it is more robust way go to Moscow is bus+train via Lobnya station. Because bus to metro usually goes trought very very hard traffic on Lenengrad highway. Metro station "Rechnoy vokzal" is preferable to metro "Planernaya" if you want to go to the Moscow centre. BTW if you want for example go to Red square near Kremlin it can takes up to 2 hours. Wowik, he wouldn't have enoth time to visit Moscow. Mikkiboy, 4 hours is too few for that because of very hard traffic in that direction. And the nearest area have no places worth visiting. 7500 rubles, espesially in Krasnodar is rather plenty of money, but if you will visit night clubs, restoraunts or pay for hotel you should take dollar or euro with you. I doubt that you can easily exchange pounds there. International lines are mainly on Ш-2. Wowik, he wouldn't have the time to visit Moscow. Mikkiboy, 4 hours is too little for that because of very hard traffic in that direction. Up to 2 hours one way to the centre! He lives not far from Sheremet'evo. 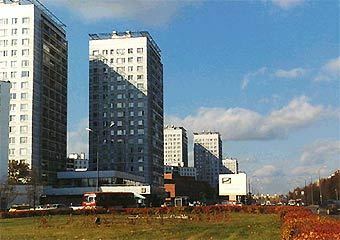 Zelenograd is located on Leningrad highway several km from there. That can explain his good knowledge of the airport. Да знаю я. Там в Химках можно в такой пробан попасть, что туши свет. Но он написал, что у него будет только 4 часа между самолётом из Краснодара до вылета в Лондон. За это время никуда не съездишь. Oh! I was wrong! I got an idea! Wowik, you can invite Mikkiboy for a cup of tea! Трансфер с Ш-2 в Ш-1 - без проблем (кстати, наверное все таки с Ш-2 в Ш-1 в случае, если lетите из Лондона в Краснодар). Если это Аерофлот, то это вообще "транзит" и бесплатный автобус между терминалами. Если разные авиакомпании, то - мaршрутка, автобус - время в пути (15-30 минут). Можно и такси, то же время, но будет стоить около 1.000 рублей (автобус и амршрутка - 15 рублей). Времени межды рейсами - полно (для спокойного трансфера и регистрации). Тут вообще не волнуйтесь. Я бы взял Евро, а не Фунты английские. Евро меняют на рубли в любом обменном пункте Краснодара, коих полно везде. Но лучший вариант - снимать деньги в банкоматах со своей дебетной карточки. Вокруг Шереметьево ничего нет, до Москвы не советовал бы ехать из-за трафика. Даже, если у Вас 4 часа свободных. Можно "попасть". Ну это надо совсем не торговаться. Даже в окошечке у аккредитованных компаний такси вроде дешевле. За 500 я думаю можно запросто. Я бы взял Евро, а не Фунты английские. Тут в Москве-то далеко не везде фунты берут. Это как фишка ляжет. Что там в Краснодаре нынче чаще натыкано. Обменники или банкоматы. Есть легко доступный городок и ж.д. станция Лобня, там ничего особо интересного нет. Есть город Химки — там тоже делать нечего, кроме как стоять в пробке. До этого у меня была похожая, но снята с большей высоты. copy some of the tiny maps from your guide book and then enlarge them on a full page. Then you can see them and be able to pull them out on the street without the whole guide book. Try to dress like a local. You do not want to stand out as a tourist. It attracts the thieves. Хм. Могут счесть за придурка. How dangerous is it to travel to russia?